Spring wind from the northern Oregon coast seems to still enliven my hair days after returning from a weekend of poetry workshops. I feel its thrill as I look at the poems I wrote, re-explore the workshop focus on metaphor and first lines – and realize how many of the twenty-six participants dived into writing poetry after retiring from “other” careers. That was the case for me. I knew the first thing I would do after retiring from a long career of communications work for the City of Portland would be to reread Leaves of Grass. The second would be to commit to writing poetry I could take seriously, to send out submissions, and assemble manuscripts. And I’ve done that. At the coast workshop, one very able local poet (younger than many of the other participants) asked workshop leaders Andrea Hollander and John Brehm about experimenting with form during a panel discussion about their poetic processes. The poet had struggled days, maybe weeks, with a villanelle that she finally gave up on. She had tried sonnets weeks earlier. She made the experiences sound like pushing things around to line up ivy vines in floral wallpaper in a rhombus-shaped hallway. The discussion moved on to the usefulness of forms as containers, vessels for emotion. I focused on what happened after the panel discussion. Three older poets, including me, stood with the young poet and encouraged her to try every single form and experiment that intrigues her and to do as much of it as she can. In other words, don’t put it off. She has plenty of time left to play at form – and perhaps find a treasure in one or more. A poem of mine that I’m very fond of, “Eight Bleached Prayer Flags,” just won one of the Persimmon Tree poetry contests held twice each year. My poem will come out in the journal’s summer issue. Submitting poets are all over the age of 60. Am I thrilled? Absolutely tootly. I have had a rough couple of weeks with journal and manuscript rejections. Then I got to thinking. What if this was a prize for a first poetry book for a person under the age of 30? Or an affirmative nod for publication in Rattle’s young poet series? What difference would that have made in my writing career? How much did I encourage high school students many decades ago to think of writing as a career when I taught high school in both New Haven, Connecticut and Portland, Oregon? Did I help them think of writing as a “forever” kind of pursuit like being fit or eating right? I’m not sure I did, and I can remember reading some student journals that made the hair on my arms stand up. A lot of the now-poets/once-something-else writers I meet these days had experiences similar to mine. Writing annual reports, newsletters, brochures, textbooks, speeches, scientific reports, journalistic articles was fun – the work managed to pay my single-parent bills and help get a daughter through college debt-free. I learned a lot about discipline and writing to deadlines. One of my supervisors was a terrific editor who hated exclamation marks. The work seemed important and fulfilling. I knew what my job title was and what I could aspire to on the career ladder. I hold onto a small scrap of paper, a remnant poem I wrote on my back porch during a rainstorm in 1993 called “The Divorcee Examines the Night Sky.” I knew poetry was a way to get at my feelings, and this poem did that. What I never considered at the time was whether I would find satisfaction in sharing those feelings, sharing my poem. The third thing I did after retiring? I walked into the local quick-print shop, sat down at its computer and designed my business card. I ordered 500. The card says Poet. That seemed like hubris at the time. That’s probably why I spent so much time fiddling with fonts and alignment. If my notebooks and old computers files can be trusted, I could have credentialed myself as a card-carrying poet at any point in my life. Although I was writing some poetry most years, a paycheck seemed to be the necessary encouragement for what I was doing. I ordered those cards seven years ago. I have less than 100 left. I’m 68 now. I have aspirations and goals. I want to find publishers for three book-length manuscripts making the rounds. My super-duper database of poems allows me to sort my poems by subject matter, season, feeling, key words, or title. It lists 947 poems. That includes the one I wrote this morning about what I found in the swash line at an ultra-low tide. I’m old enough that I sometimes see a title for one of those poems and have no idea what the poem is about. 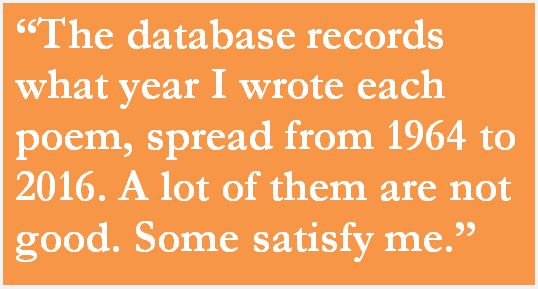 The database records what year I wrote each poem, spread from 1964 to 2016. A lot of them are not good. Some satisfy me. I’d like to get to 1,000 with the balance tipping toward satisfying by the end of 2016. Maybe I won’t. Or get to 948 with a great poem. Maybe another book in print. What’s this all about? I wish I hadn’t waited so long. I’m sorely tempted to go back to that print shop and make new cards that say Astronaut. 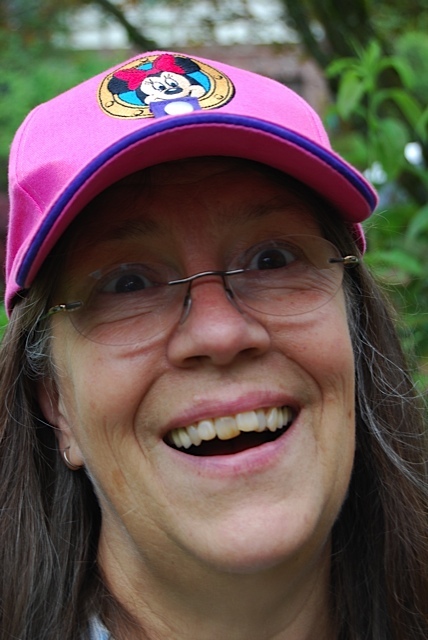 Tricia Knoll is an Oregon poet whose work has appeared nationally and internationally in journals and anthologies. Her chapbook Urban Wild (Finishing Line Press, 2014) highlights interactions of human and wildlife in urban habitat. Her new book Ocean’s Laughter takes its title from one of Pablo Neruda’s questions: Do you not also sense danger in the sea’s laughter? Ocean’s Laughter combines lyric and eco-poetry to look at change over time in a small town on Oregon’s north coast. Knoll maintains gardens for native plants, roses, pollinators and vegetables. She runs, dances, and tweets haiku and poetry. She is thankful to Trish Hopkinson for not waiting to send out poetic hints and submission ideas. Keep writing Tricia! You’ve inspired me to write faster and experiment with new formats. We’re never done young lady. I think I learned that a while back. It’s really freed me to approach everything I write, to include my new genre erotica, with a zest and commitment noone else has!!! Onward & upward and thanks for the post! This is great, inspiring. Thanks for your thoughts on poetry. You have so much energy to be so prolific as you are. I hope in some measure to emulate your work. I’m just figuring out this business about copyrights, so I can be free to submit my poetry and also create a new poetry booklet on my own. At this point I’m a neophyte unabashedly. You’ll get the hang of it. Just takes some practice :). I haven’t been at it long. thank you as always. the service which you provide so assiduously and kindly has earned both my great gratitude and greater awe.